Sidenote: I'd like to thank every last one of you for reading my columns over the past two plus years. Today marks the official release of my 300th entry and all things aside, I'm a little surprised. To all who offer up numerous words of encouragement and support, I thank you. This hobby of mine truly wouldn't be what it has become if I didn't believe you enjoyed it as much as I do. Whoa! Now let us get after another installment of Keep It Real Friday. For those of you who haven't read the first 299 columns, I won't hold it against you but I will fill you in. Keep It Real Fridays are designated to keep all things in sports, in check. I.E. Coach XYZ tells you his players are going to war, I follow with a fast reminder that Pat Tillman was going to war and your playing a game. Picking up what I'm putting down? Good. Mike Vick is an Eagle, why wasn't this more obvious? Does anyone else remember their fans throwing snowballs at Santa? Or booing Michael Irvin's broken neck? This was a brilliant idea, believe me. Controversial yes, but great none the less. Word to the PETA supporters, stay 1,000 feet from any Eagle fan and you'll be doing yourself a favor. On the field, Michael Vick can add yet another dimension to an eccentric Eagle offense. Undersized versatile wideouts, a streaky veteran quarterback, running backs that do everything but carry the water jugs, and now your going to add Michael Vick? Scary. It's hard to argue that the style of what Michael Vick is and what Donovan McNabb has been isn't similar. Maybe Andy Reid believes that Donovan can teach Michael what to do with his game after he's got some years on him, if that's his direction; pure genius. I'm shocked that I never came to this conclusion before but Philadelphia is a perfect place for Michael Vick and his trailer full of baggage. Those fans, that town, they'll rally behind anyone. Allen Iverson? Mitch Williams? Donovan McNabb? If you can bring something to the table they are just as much on your side as anyone. If the City of Brotherly Love can erect a statue for Rocky (a fictional boxer), they can protect Michael Vick from the hoards of people who attempt to pile on. PETA beware, this ain't your type of town. Keep It Real! speaking out about his carelessness during the early 2000's in regards to muscle supplements specifically andro, and this week speaking of his continued carelessness and disregard for appropriate supplement use. Now it's my turn Bronson. (1) Your actually a .500 pitcher in your career 81-81, with a career earned run average of 4.38, unimpressed. Bronson whatever your taking, up the dosage. When Big Mac popped flintstones he crushed homerun records. When Roger Clemens had a little extra, he won 300 games. When Barry Lamar rubbed on "the clear" he became the greatest offensive weapon of all time. Whatever it is your using it isn't the answer, I'll point to your win-loss record to bring that home. (2) What would make you think we cared when you spoke? 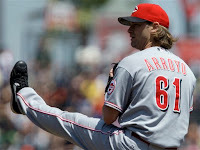 Your Bronson Arroyo and if you hadn't had the fortune of playing in a Red Sox uniform, we wouldn't even know your name. Fact. Bronson, Keep It Real! Tiger, Tiger Woods Ya'll. Love me some Tiger Woods. At some point over the last 299 columns I must have mentioned a thing or two about the greatest sports icon over the past twenty years, if not, well here goes. Tiger Woods is what no one else can be. Maybe golf isn't your typical sport, basketball, football, hockey, whatever. However, what Tiger Woods has done for golf is what our president is doing for politics. It's acceptable to the next generation to tear up the greens rather than the blacktop. It's acceptable to the next generation to wear your own initials on your hat rather than a symbol or a brand. Tiger Woods isn't Ali, and it's because of people like Ali that Tiger Woods never had to choose to fight another mans war. Tiger Woods isn't Michael Jordan, his jerseys aren't flying off the shelves. Nope, Tiger Woods is bigger than all of that. Do you know why we watched the World Golf Championship this year? It isn't a major tournament, no one is getting a green jacket. We watched the tournament because Tiger Woods was in contention. Do you know why were talking about the PGA Championships on Thursday night? Because Tiger just slapped around a 67 in the first round to take day 1. Tom Brady is a 3x Super Bowl winning quarterback, not many can say that. But do you know whose knee was a bigger concern for the worlds sports fans, Tiger's. Move over Michael, no one is and will be bigger than Tiger Woods. Keep It Real! Late Addition: Alot of negative feedback about my confidence in Josh Beckett as the American League Cy Young. Even more feedback once Justin Verlander pitched a 4-hit, 8 inning gem against Boston on Thursday afternoon. But since you asked for it, may I remind you that YOU asked for it, I'ma make you believers. In 8 of his 23 starts, Beckett has allowed exactly ZERO earned runs. Against both the Yankees & Tigers, two playoff hopefuls, Beckett is 4-0 which doesn't include a 7-inning, 4 hit, 0 earned runs performance against the Yanks this past weekend. Boasting a record of 14-4 gives him the highest win total in the Major Leagues. Furthermore, he's overdue and with all respect he's earned it. Between May 5th and June 26th the Red Sox ace allowed just 15 earned runs in 10 straight starts, and after his first three starts in August where Beckett has allowed just two runs he seems to be back on pace. I'm not trying to take things away from pitchers like Justin Verlander but he isn't Josh Beckett. Final thought: In at least three of Beckett's five no decisions this season he's allowed only two runs. I know you could say it about any pitcher but Josh Beckett is inches away from having 17 victories at this point. Cast your vote for Verlander if you want but Josh Beckett is the games elite starter. KEEP IT REAL! That's all for this week but you can check out the latest episode of The RightNow Podcast on iTunes or by clicking on that link. Also you can follow the co-hosts tweets on Twitter.